It’s an exciting blend of models for the 2018 Jeep Grand Cherokee. There is something for everyone; whether it be diesel or petrol, pure luxury or luxury-rugged, a new Jeep Cherokee is designed for any occasion. And, if you thought that the quickest SUV was a Porsche or Audi, think again. Jeep even has a Grand Cherokee Trackhawk with a 0-100 km/h sprint time of 3.7 seconds and a quarter-mile run of 11.6 seconds! Getting yourself into a new Jeep Grand Cherokee at the base level gets you a Grand Cherokee Laredo variant that has the familiar Pentastar V6 petrol motor. You can get the Laredo in 4×2 and 4×4 modes, however if you want to head off down some muddy tracks then I suggest you get yourself the 4×4 model. The 4×2 Laredo will be perfectly adequate for a picnic in the park and getting the kids off to school after some shopping at the mall, but even this model has plenty to boast about. At Jeep, the motto is to generously lavish any Grand Cherokee model with plenty of features to make the drive pleasant and enjoyable. You’ve got plenty of SUV room in the interior, so comfort for five adults is excellent. Laredo models come equipped with acoustic glass, dual-zone climate control, keyless entry, heated front seats and a Uconnect 7-inch touchscreen. The Uconnect 7.0 touchscreen includes Voice Command with Hands-Free Calling, allowing the driver to make use of the infotainment system without losing focus on the road. There are also steering wheel mounted controls in Laredo models. Laredo variants have an 8-speed auto that is smooth and robust. Parking sensors front and rear, a rear parking camera, Bi-Xenon headlamps and seven airbags complete the 5-star Grand Cherokee Laredo package. Step into a new Jeep Grand Cherokee Limited, and Jeep pack in the features. Capri leather heated front and rear seats with accented stitching do give a real sense of occasion, while 20-inch alloys and chrome detailing add to the exterior style. A Uconnect 8.4-Inch touchscreen, satellite navigation, a premium 9-speaker Alpine sound system, a powered rear gate, deep tinted privacy glass, adaptive cruise control, a heated steering wheel and driver’s seat memory provide some special Limited luxury features. Limited models also get Forward Collision Warning, Lane Departure Warning, Blind Spot Monitoring, Rear Cross Path Detection, Parallel and Perpendicular Park Assist, and Advanced Brake Assist systems. Most people driving a Jeep will be well aware of the 4×4 off-road capabilities of Jeep vehicles, so for those who like to make the most of the legendary off-road performance, then the Grand Cherokee Trailhawk will impress. Boasting the new Jeep Quadra-Drive II 4×4 system, the Quadra-Lift air suspension and rear electronic limited slip differential, it’s in the Trailhawk that you get a sense of just how formidable the Grand Cherokee can be off-road. Wheel articulation is excellent, and getting into some serious off-road terrain in the Trailhawk makes for a great adventure. Trailhawks also have a Selec-Speed system with Hill Ascent Control for when conditions get a little hairy. Rugged underbody skid plates, front red recovery tow hooks, all terrain tyres and tough 18-inch alloys designed for off-road work are other assets the Trailhawk has for mastering the tough terrain. Inside the Trailhawk interior are nice Nappa leather seats with suede inserts for added style. The front seats are ventilated and the Trailhawk model has unique front and rear panels that define this model from the other Grand Cherokees. If you like the thought of having the off-road features of the Trailhawk but still want premium luxury, then the new Jeep Grand Cherokee Overland is stunning. Darkened privacy glass all-round, a lovely dual-pane panoramic sunroof, Nappa leather seats with heating and memory functions, and very elegant wood interior trim and a distinctive leather steering wheel make for nice touches of elegance and luxury. The sporty Grand Cherokee is the new Jeep Grand Cherokee SRT, and I’ve got to say I love the racy interior styling. There are a few features that make the SRT standout from the other models. The Uconnect infotainment system has special “Performance Pages” for the driving enthusiast. A very nice SRT premium audio system adds awesome music clarity and there is even a G-Force meter to entertain. For those who love to feel the acceleration of the big 6.4-litre Hemi V8 engine, the SRT model has a 0-60 and quarter-mile timer along with the Drive Performance Feedback package. With a 0-100 km/h dash completed in around 4.9 seconds, you’ll feel like you’re in a super special sports SUV. Now, about the SRT interior; what makes the rich SRT interior so gorgeous is the premium leather sport seats with accented stitching that sets the gorgeous racy tone. Beautiful dark-ruby red leather looks stunning along with the classic styled gear lever and leather wrapped SRT steering wheel. This is a ‘Signature’ interior from Jeep that you haven’t seen before – just lovely. Models of the 2018 Jeep Grand Cherokee can be powered by the new turbo-diesel engine that pushes out plenty of power and torque, while making exceptional fuel-efficiency the norm. A full 184 kW of power can be reached. Combine that with the hefty 570 Nm of torque available from 2000 rpm, and this is a new Jeep EcoDiesel that provides serious grunt. Jeep claim that models equipped with the turbo-diesel can tow up to 3500 kg when properly equipped appropriate towing features designed for this sort of load. There is also a 5.7-litre petrol motor for Overland models. Just for the heads-up. 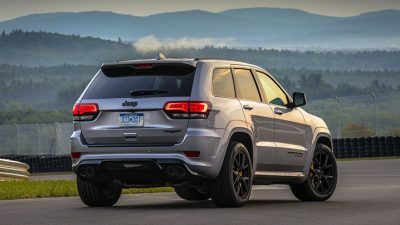 A new 2018 Trackhawk Grand Cherokee is the performance master, or should that be monster! With a tuned 6.2-litre, Hellcat, Supercharged V8 engine putting out 522 kW of peak power and 868 Nm of torque, its little wonder that the 0-100 km/h sprint can be completed in just 3.7 seconds. Having completed the quarter-mile in 11.6 seconds, the Grand Cherokee Trackhawk can run on to 290 km/h. This is Sports SUV taken to the next level. You’ll need to ask nicely at Jeep to see if they’ll bring this model over from America. Out on the open road, the standard Grand Cherokee Laredo and Limited versions are beautifully composed and the ride comfortable over any terrain. Big stopping power and loads of grip are enjoyable characteristics of the new Jeep. In turbo-diesel form, the Grand Cherokee is hard to beat; the engine is smooth, powerful and suitably fuel efficient. Elegant interiors make travelling in a Grand Cherokee a special experience. 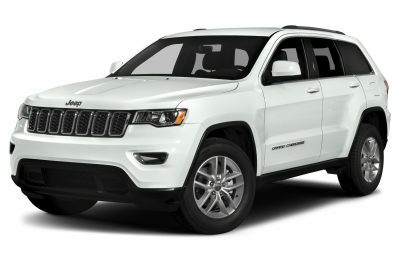 For any more information on the new Jeep Grand Cherokee models or, for that matter, any other new car, contact one of our friendly consultants on 1300 303 181. If you’d like some fleet discount pricing (yes even for private buyers! ), we can submit vehicle quote requests out to our national network of Jeep dealers and come back with pricing within 24 hours. Private Fleet – car buying made easy!